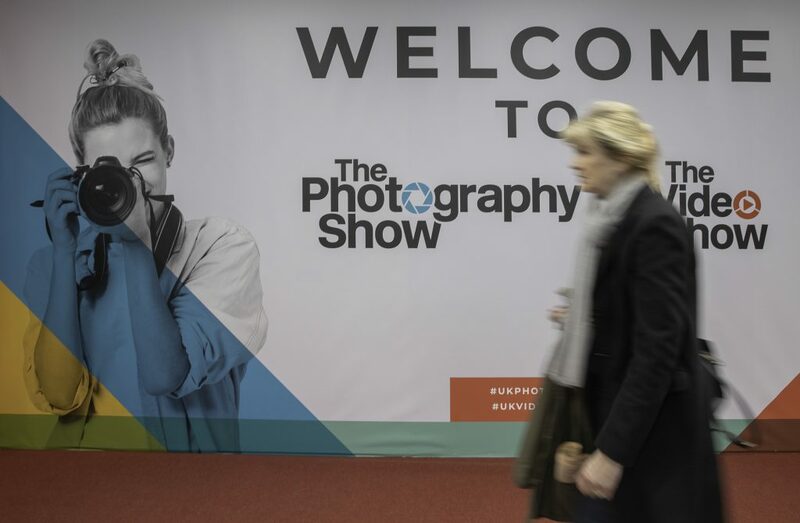 The Photography Show has become a key event in the UK for photographers. This year’s event saw 450 different stands, ranging from the major camera manufacturers to small companies selling props for baby shoots. The show is also a great place to hear professional photographers talk about their craft. Held over four days, it’s a real treat for anyone interested in photography. We spent a couple of days at the show and here are our highlights. Disappointingly, Adobe didn’t attend this year’s show. However, their usual huge stand was replaced by the major sponsors for the event, Canon. It was fairly obvious that all the camera manufacturers are fighting over the mirrorless market. Sony, Nikon, Fuji and Lumix also took up a large part of the floor space and all were pushing most of their estate toward the DSLR’s lighter brothers. Attendees to the show were granted a real exclusive. At the February launch of the Canon RP in Japan, Canon showed off 5 new lenses, especially for mirrorless cameras. 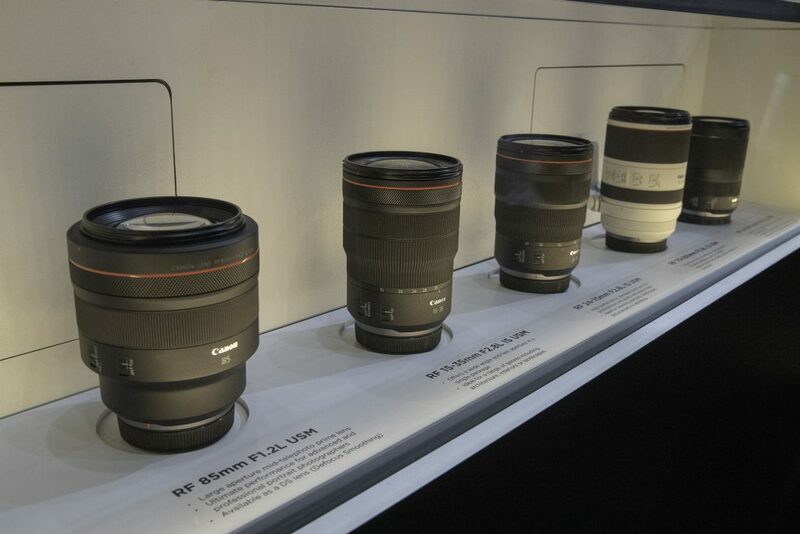 There on the stand on the Birmingham show were the 5 lenses – their first viewing in Europe. Four of the lenses are definitely aimed at the professional. None of the lenses was working models as the lenses will be gradually launched during 2019 but they do give an idea as to how they will look. The RF 70-200mm F2.8L IS USM is noticeably smaller and stumpier than its EF equivalent. This has been achieved by making the lens extend forward as the zoom is pushed to the long end. It should make fitting lenses into your bags easier, although with the 82mm diameter I don’t think it will be much lighter. To complete the holy trinity of lenses, Canon also had an RF 24-70mm F2.8L IS USM and an RF 15-35mm F2.8L IS USM on display. Both of these lenses are bigger than their EF equivalents. It seems strange that as mirrorless cameras are getting smaller and lighter, the lenses are getting larger. By all accounts, the image quality of the lenses is going to be far superior to the DSLR equivalents so the extra weight will be the price to pay. The range was completed by an impressive RF 85mm F1.2L USM prime lens. This will be absolutely superb for portraiture but expect it to command a top end price. There was also a great travel lens, the RF 24-240mm F4-6.3 IS USM – expect this one to be at the opposite end of the budget when it’s launched. 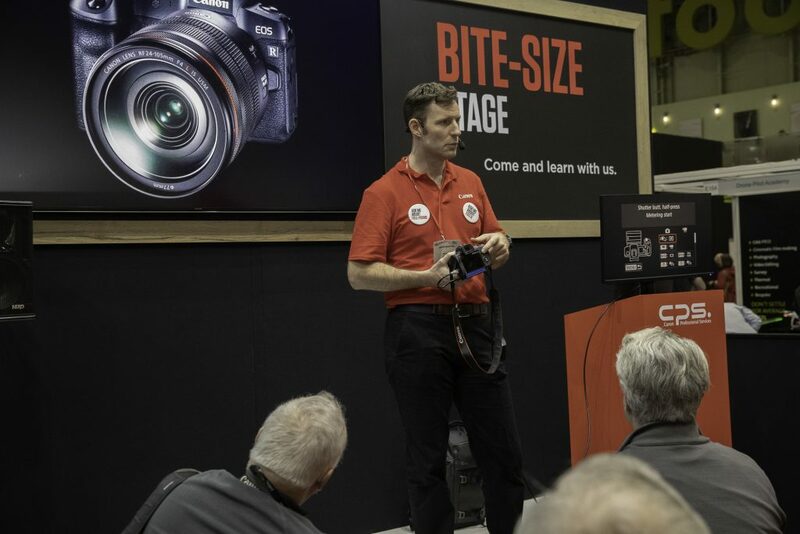 It was good to listen to a demo by David Newton of the new Canon EOS R camera. There were two game-changing features of this camera system demonstrated. The first is the Control Ring. This is on all the RF lenses and is also available on the RF mount which converts EF lenses to work on the mirrorless cameras. It’s now possible to set this additional ring on the lens to either change the lens aperture, shutter speed, ISO or exposure compensation. The second innovation is the capability to set your focus point using the rear screen of the camera whilst looking through the eye-piece. Sure, you have been able to do this in Live view mode in the past. However, now you can allocate either the full screen (not recommended) or specific areas of the screen. I’m a right-eyed shooter, so I could set the top right quarter of the screen to be where I set focus points. I had a 10-minute play with the camera after the demo and it became really quick and intuitive to move the focus point using my right-hand thumb. As well as the trade stands, the organisers of The Photography Show bring in some quality speakers. On the Saturday of the show, we had the privilege to listen to two photographers right at the top of their games. Former White House official photographer Pete Souza and Magnum photographer Martin Parr. Souza spent eight years as President Obama’s photographer. That sounds like the dream job until you hear that he only had one day off in that entire period. Souza first met Obama in 2005, four years before he became President. The photographer had previously served as an official White House photographer for President Ronald Reagan from June 1983 until 1989 and was asked a few days before the inauguration to take up the role for Obama. Souza’s goal was to create the best photographic archive of a President that has ever been done. His 90-minute talk shows that he probably achieved his goal. Using selected images from his book Obama: An Intimate Portrait: The Historic Presidency in Photographs, he led us through major events, times of war, sadness and joy and family moments that could only be captured by spending so much time with the President and his family. Since 2017, Souza admits he hasn’t been taking as many photographs as he could be. Part of his time has been spent responding to the tweets and actions of the current President with photographs showing how Obama dealt with similar scenarios. Souza does this with humour. For example, in one of his first images, he showed the size of the crowd at Obama’s first inauguration with the comment, “that definitely was the biggest crowd of any inauguration – no matter what others may say”. Similarly, one of his images shows the time and effort that Obama took in refining and finessing one of his speeches with a document littered with crossings out and handwritten amendments. Souza commented that ‘every word counts’, before briefly flashing up one of Trump’s tweets. Much of the remainder of his time has been spent photographing a former Army Ranger, Corry Remsburg. Souza first photographed Remsburg in 2009 when he parachuted into the D-Day commemoration in Normandy in 2009. This innocuous meeting was made more important when eight months later he photographed the President’s visit to a grievously wounded soldier at a military hospital. It was Cory, and he had nearly been killed by a massive roadside bomb in Afghanistan. Obama and Souza continued to visit Remsburg throughout his Presidency and witness the slow recovery to the point where seven years after the incident Corry was able to walk into the Oval Office to meet the President. 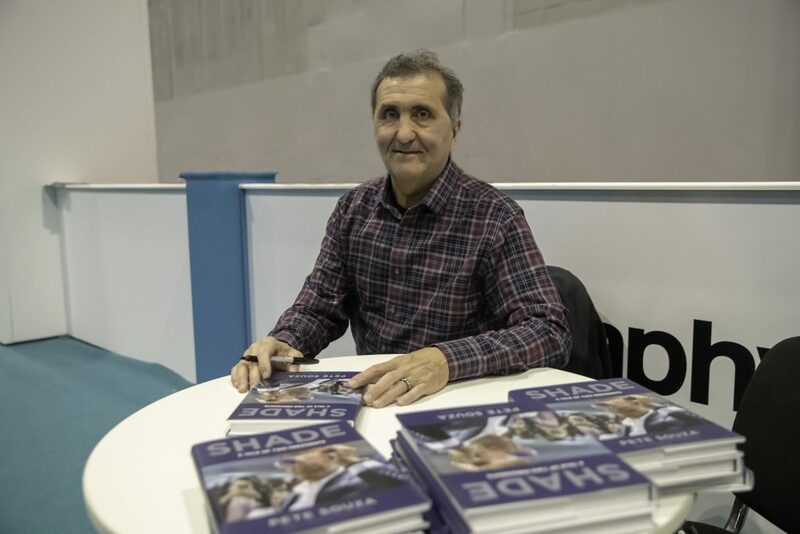 Souza has continued this relationship to produce a body of work which he hopes to publish in the near future. Perhaps the most telling quote of Souza’s talk was his final words. “I know I’m not the best photographer in the world, but I was the best person for the job”. A humble man who has captured a stunning archive of Obama’s presidency. Prominent Magnum photographer Martin Parr opened his talk by sharing what had inspired him to become a documentary photographer, or as Magnum rightly describe him, a ‘chronicler of our age’. While photojournalists have tended to be attracted to the ‘other’ and exotic associated with other cultures and ways of living, Parr started his career wanting to look closely at British identity and lives. In particular, he was interested in documenting the English middle classes, who he felt were invisible compared with street photography of the working classes or portraits of upper-class pageantry. Parr’s work will be familiar to most photographers, as will the humour he brings to his documentation of English middle-class life and leisure. The questions put to Parr at the end of the talk focussed on his relationship with the people he photographs, especially on whether he seeks their permission to photograph them. Parr doesn’t, at least not in the UK where the law is on his side. What Parr’s work shares with Souza’s is the importance of being able to document while being unobserved. It’s essential to Parr’s documentary work that he is an observer and recorder of the lives and leisure he finds. A huge part of Parr’s work relates to his practice as a collector, and curator, of photography. He is self-confessedly fascinated by how we experience photography through everyday objects, from looking at influential photo-books to the kitsch objects that might adorn our homes. Parr’s talk finished with an in-depth look at his Autoportraits. These are Parr’s self-portraits, and they present a vision of the photographer in many guises. From photo-booth backdrops to postcards and well-known shots by street photographers, Parr uses these ‘found photos’ and inserts himself into them, in increasingly fantastical and satirical settings. They are also a way for the photographer to turn his lens away from home. In an image titled ‘Russia’ (2008), Putin and Parr himself fist-punch the air in an idyllic Black Sea beach scene. The setting is Yalta in Ukraine, which was annexed by Russia in early 2014. Like Souza, Parr’s talk finished with a reference to a world leader. In contrast to the often unthinking ‘selfie’ culture that seems to focus on the individual and treat other places and cultures as mere backdrops, Parr’s ‘self-portrait’ speaks volumes about the political world around us and the risks of not looking beyond ourselves. Whether looking at ourselves or others, Parr’s message, if he has one, would seem to be about the importance of looking, and looking closely. Whilst The Photography Show is huge in the UK, it isn’t normally where new products are launched. Photokina in Germany is normally the European launch venue. However, as it is changing when it runs, from September to May, it is having a year off. Lee Filters used this opportunity to launch a new filter system at the UK show instead. The new Lee100 system is an upgrade on what has, until recent times, been the professionals’ filter system of choice. The updated system has three innovations, including a locking dial that can ensure the filter system doesn’t flick off inadvertently. An easier way to increase the number of slots for filters from two to three. The others are a new circular polariser and fitting system. I have been a Lee user for many years, but unfortunately, it feels like Lee has not managed to catch up with some of the new start-ups. NiSi had their V6 system on display for the first time which has also made some improvements to their locking system, as well as making the circular polariser easier to insert and remove. I was most impressed though with a name new to me. The Kase Filters system also has a lock on the side to prevent accidental removal but they have two innovations that made them stand out over both Lee and NiSi. Firstly, is the very cool magnetic circular polariser. Rather than having to screw the polariser on to the system, it clicks into place magnetically. Similarly, a gentle push removes the polariser. I’ve always found attaching and removing polarisers a trying task on a cold day, so this will save plenty of time. The second innovation is the Wolverine filters which you can see in action below. Throughout the day, the filters were being dropped onto the hard floor of the NEC without so much as a crack or scratch! I have scratches on my 8-year-old Lee filters and I am in the market for new ones – I think the Wolverines could be my replacements and being used in future Landscape and Seascape Workshops.